Following up with Apple's addition of in-app purchase warnings in iTunes, the company recently rolled out the same feature for App Stores as seen on iOS devices. Apple on Friday quietly implemented notifications in iTunes alerting customers that certain titles, while free to download, support in-app purchases. 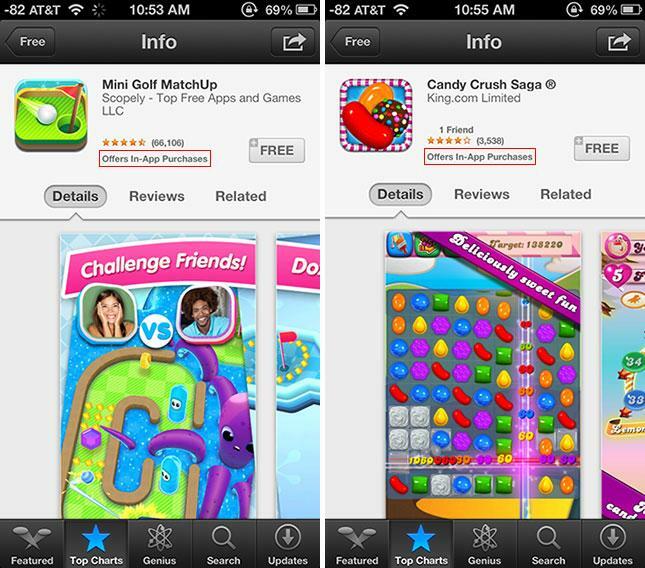 As spotted by Apple'N'Apps, the company is now displaying the same warnings in the iOS App Store. The new notifications are an attempt to stop inadvertent purchases made by children who rack up charges on their parents' credit cards for digital in-game items. Apple recently settled a lawsuit leveled by a group of parents who claimed their children were spending hundreds of dollars on game currencies without realizing the real world effects of their actions. The company ultimately doled out $5 iTunes gift cards or cash equivalents, or full refunds for cases where the cost exceeded $30.